Hold yourself together... I'm blinking away tears, and have no idea when they started falling. Maybe when I first saw Karen, glowing and beautiful in her white dress. Or when I caught Joe's beaming face as he watched her walk down the aisle. No, it must've been the vows—their emotional exchange of promises as they recounted all the things they love about each other. No matter, no one can see me. In the blink of an eye, we're up from our seats, applauding and cheering as they kiss and make their way down the aisle as newlyweds. Husband and wife. Mr. and Mrs. Joe and Karen Paone. They do! As the guests flock to the bar and appetizer tables for the cocktail hour, I duck into the cottage where the cupcakes are on display: Three tiers of cupcakes sitting on a cloud of rose-tinted tulle, topped with a photo of Karen and Joe. 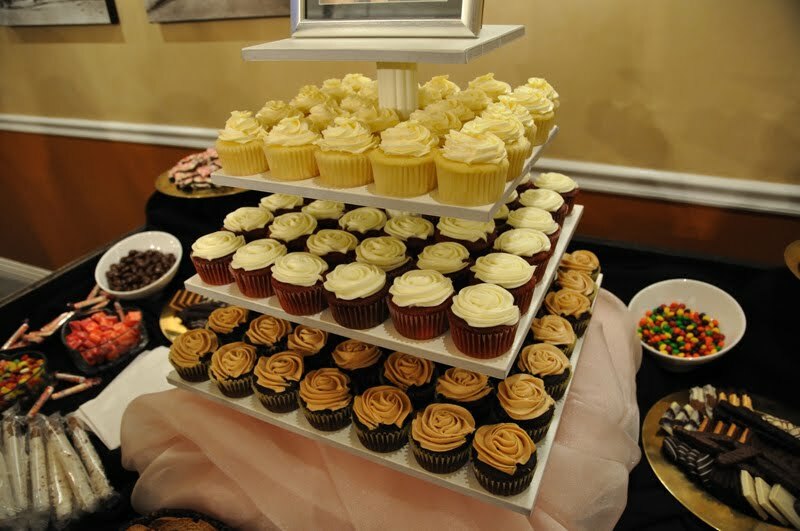 The cupcake tier is the centerpiece of a rustic wagon filled with assorted candies, cookies, and other sweets. 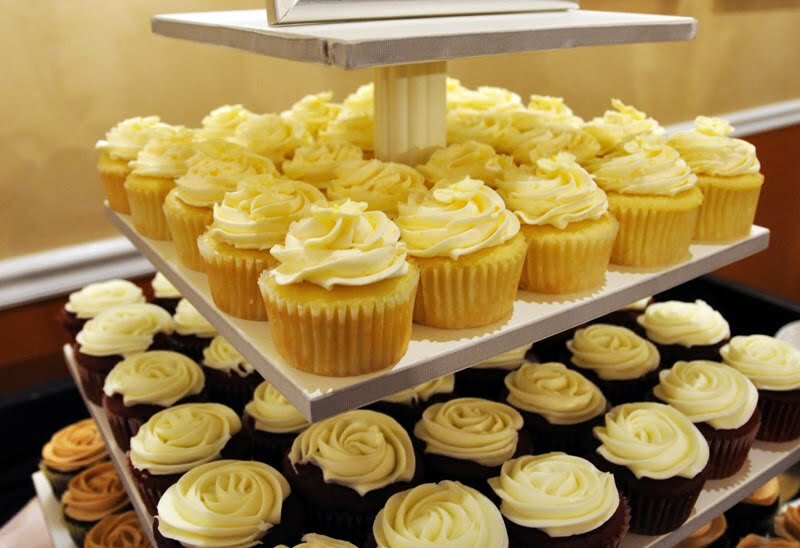 I move one of the vanilla peach cupcakes a hair to the left. This is the culmination of a sleepless night spent mixing and baking, frosting and decorating. It's the end of 121 miles of travel from San Francisco to Monterey, where each bump and turn sent me into a mild panic attack. And this is the first time I've ever baked for a wedding. I'm nervous. I'm thrilled. I'm running on adrenaline. 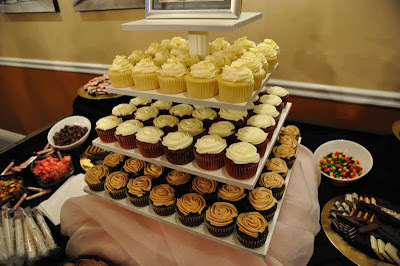 I take one last look at the cupcakes stacked neatly on the tier before rejoining the festivities. 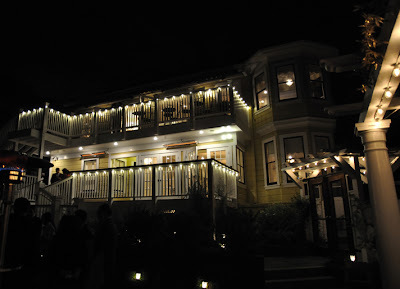 Dinner is delicious, the speeches are heartfelt, and the slideshow draws laughter and aww's from the guests. Before I know it, it's time. I hold my breath as everyone makes their way into the little cottage. All eyes are on Karen and Joe as they each select a cupcake. 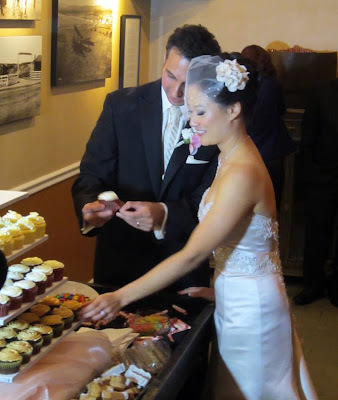 Joe chooses a red velvet, while Karen takes a peanut butter cup, and they playfully take a bite of each other's before finishing their own. The cake has been "cut," the couple is beaming, and the guests flock to the dessert table. I can't help but smile when the compliments come. They like the cupcakes. They really like 'em! The rest of the night is a whirlwind of dancing and laughing, and I'm out like a light the moment my head hits the headrest on the ride home. Karen and Joe—congratulations! 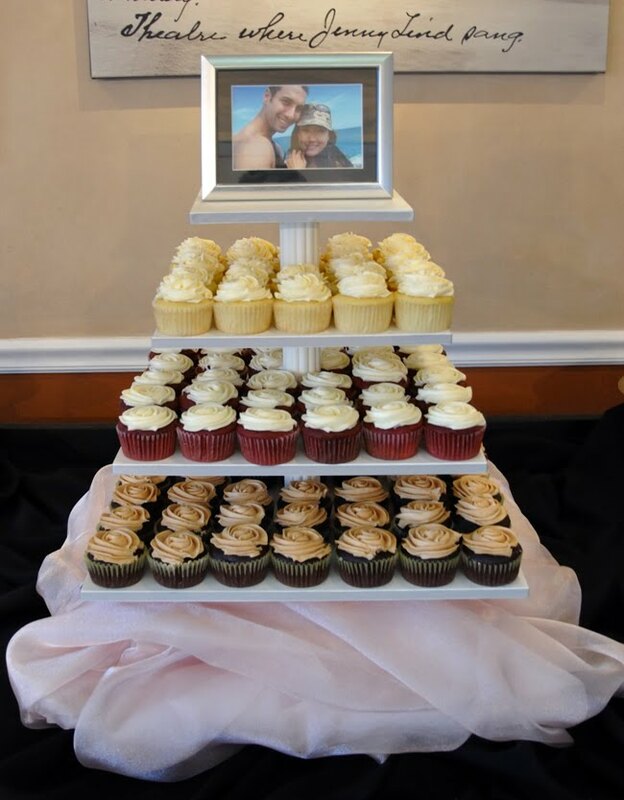 From Cupcake Wars to your beautiful wedding, you've helped me grow so much as a baker this year. I can't thank you enough for your trust and support, and am so incredibly happy for you. And thanks so much, V, for being such an amazing baking assistant and photographer. I really couldn't have done this without you.